The HeadAmp6 is a fully-featured six -channel stereo headphone amplifier that includes six auxiliary inputs to allow separate “more-me” mixes on each headphone channel. Each output channel has a dual function Balance Control which will pan between Left & Right input of the main signal bus, or vary the mix between the main stereo signal bus and the auxiliary input for that respective channel. Each output channel includes one front and two rear panel stereo 1/4-inch TRS head-phone jacks for ease of installation and quick patching capability. Mono, Mute L, and Mute R select buttons and on each channel select between four operating modes; 1) Stereo, 2) Mono Left, 3) Mono Right, 4) Mono Both (Left & Right) for versatile monitoring solutions. Independent output level controls on each channel personalize monitoring levels. 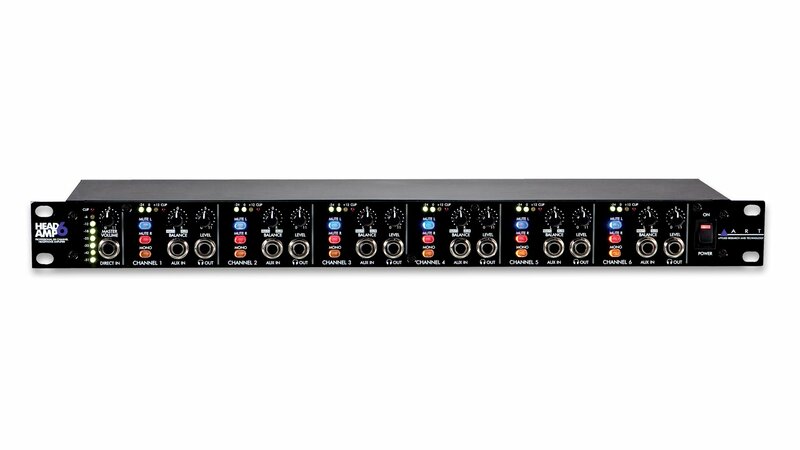 Input options include XLR and 1/4-inch TRS balanced inputs with matching “Thru” jacks for bridging multiple units. An additional front panel stereo 1/4-inch TRS Direct In jack for quick patch override of the rear panel inputs is included for quick insertion of any stereo source. Master Volume control sets the main signal bus level. Eight-segment precision LED level metering on the main bus and four-segment indicators on each output channel provide visual feedback of the signal level at all key points.